Thanks for checking back in! Drop me a note and let me know you've been here! I'm always wondering if anyone is out there or if I'm just typing to myself! This card was super easy and simple, but it's truly one of my favorites because it's so clean and has just enough! 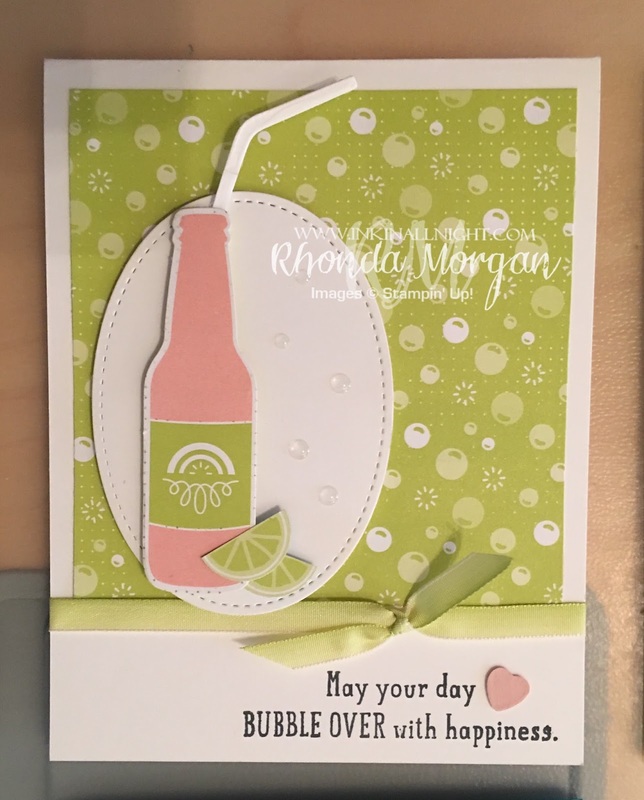 It is a 4.25"x11" card base, with a 4x4" layer of the bubbles DSP, added an Oval Stitched Shapes to attach my soda bottle too! It just makes me think of a nice cold pink lemonade, served with a slice of lime! ha! And that little lime is actually punched out of the bottle caps dsp page with a circle punch and then sliced in half! I don't know how well the Clear and Glitter Epoxy shapes show up but they are on the oval layer, creating bubbles to go along with our background pattern as well as our greeting! This may be one of my make n takes for a Bingo Event I am planning for January! Stay tuned for more details and registration starting soon! !